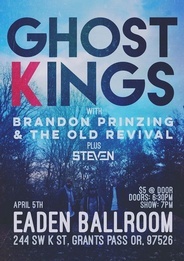 Come hang out with us and our best friends in GHOST KINGS, Brandon Prinzing & The Old Revival and our new friend Steven! It will be a fantastic night of great music and great friends! $5 at the door-All ages, everyone is welcome, bring a friend or two! Doors open at 6:30pm, show starts at 7:00pm!